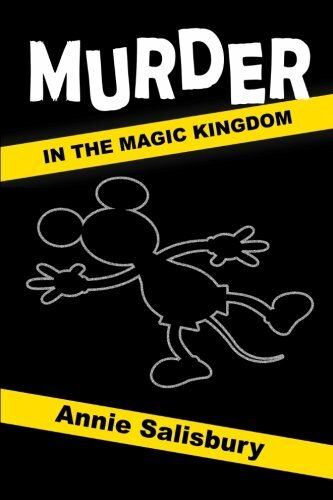 Note: There are two books with the title Murder in the Magic Kingdom listed on Amazon. This review is for the 2014 book by Anne Salisbury, not the 2008 book by Foreman Heard. Disney World cast member Tommy Boyd’s murdered body is found in the waters of the Jungle Cruise attraction and Josh, another cast member, comes under scrutiny because Tommy was inexplicably wearing one of Josh’s uniforms at the time of his death. Though Josh isn’t detained, due to lack of evidence, he rightly feels that they’ll stop looking for other suspects unless he finds some compelling evidence to prove his own innocence and to point their attention elsewhere. I don’t want to give anything away but what follows is a fairly short book (only 154 pages) that moves quickly through the Disney World theme parks to catch the real killer. What I like: A lot of Disney park based fiction has a common theme of the current Disney leadership being motivated solely by profits and the need to find a rightful successor to carry on Walt Disney’s true spirit and vision for the parks. That is fine - I’ve certainly imagined what I would do if I was at the helm of the Disney corporation – but it can also get monotonous. Murder in the Magic Kingdom doesn’t go there; it simply places a murder mystery into the current Disney World setting. The author is a former Cast Member so she weaves both the public and backstage areas of the park into the story in effective ways. Josh, the lead character in the book, is likeable but refreshingly normal; he isn’t a genius or drop dead gorgeous – he's just a regular guy who was dropped into a bad situation and you can’t help but hope that things work out for him. What I didn’t like: The book would’ve benefited from better proofreading; there is a your/you’re mistake which is easy enough to read through. There are a few places where the wrong word is used and it sort of stops the flow of the story as your brain tries to fill in the right word; for example, there is one place where one cast member “shames” the hand of another instead where it should’ve been “shakes”. I felt like the book ended rather abruptly with too many loose ends; in particular, the main character was feeling like he was simply treading water in both his career and his relationships and there was nothing to indicate whether this rather dramatic set of circumstances helped him to find clarity or come to any decisions about his life. Final thoughts: The author has only published two books and this is her first fiction effort; her first book, which I have not yet read, is an autobiographical account of her experiences as a Disney VIP tour guide. Murder in the Magic Kingdom isn't a bad first work but may have benefited from a little more work and a little better editing. I bought the Kindle Edition and, at $4.99, it was an enjoyable, light read providing a quick fix to satisfy my Disney theme park addiction; I probably would’ve been disappointed if I’d purchased the paperback version for $14.95. About the reviewer: Annette has been reading mystery novels since she discovered Nancy Drew in her school library. She and her husband love the Disney theme parks and launched Build A Better Mouse Trip / Mouse Trip Travel, a Disney-focused travel agency, over ten years ago so that they and their agents can help others experience the wonder and the magic of the Disney theme parks.